The Castle Neighbourhood Grill is a difficult-to-find location if you don’t know what you’re looking for. Currently nestled within a residential community, this spot previously housed the Dublin Castle Irish Sports Grill (which we were sad to see go) and, more historically, the BC Penitentiary Guard House that closed down in 1980. 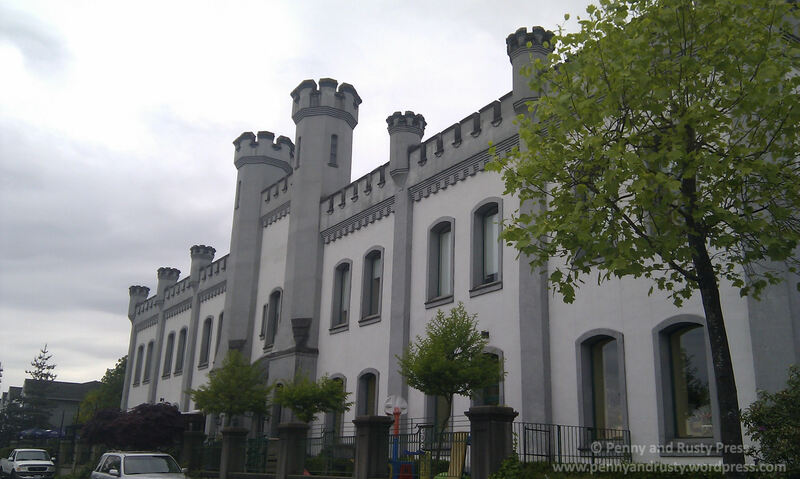 The exterior of the building is pretty much the only aspect of this establishment that resembles a castle. Inside, it remains pretty much the same as the prior Irish pub that occupied the location, including the menu selection. Their meat pies are a definite must try as the delicate yet flaky puff pastry is quite good. The Steak and Guinness Pie ($13) is smothered in a rich Guinness gravy with onions and mushrooms. 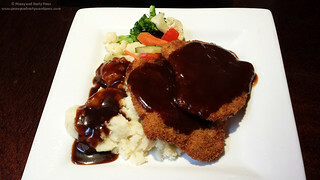 They also have non-Irish food such as the Pork Shnitzel ($18) which includes two breaded pork cutlets served with mashed potatoes and Guinness gravy. The grilled seasonal veggies were just meh (and didn’t even look grilled) but the shnitzel was pretty good and only helped by the rich gravy. Despite the hard-to-find location, this pub was quite full when we visited – no doubt from local patrons. 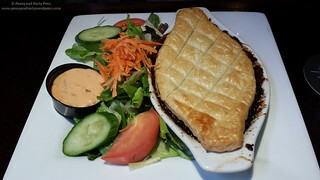 Posted on February 27, 2015, in Casual - burgers and stuff, Irish, Pub, Restaurant Review and tagged Food, New Westminster, Pub, restaurant review, Sapperton, Steak & Guinness Pie. Bookmark the permalink. Leave a comment.